The Bayonne Bridge is an arch bridge spanning the Kill Van Kull connecting Bayonne, New Jersey with Staten Island, New York City. It carries NY 440 and NJ 440. It is the fifth-longest steel arch bridge in the world, and was the longest in the world at the time of its completion. The bridge is also one of four connecting New Jersey with Staten Island; the other two roadway bridges are the Goethals Bridge in Elizabeth and Outerbridge Crossing (which also carries NY/NJ 440) in Perth Amboy, and the rail-only Arthur Kill Vertical Lift Bridge, all of which traverse the Arthur Kill. The original 155-foot (47 m) roadway carried two lanes of motor traffic in each direction, as well as a walkway. A project to provide increased clearance required to accommodate New Panamax ships began in 2013. Half of the new 215-foot (66 m) roadway was opened to one lane of traffic northbound and southbound on February 20, 2017, and the second half of the roadway was fully opened on February 11, 2019. The new roadways each carry two lanes of unidirectional motor traffic plus shoulders for disabled vehicles in addition to a new walkway, which will be opened later in 2019. Though desired navigational clearance was achieved June 8, 2017, the project is not expected to be fully completed until February 11, 2019. The eventual design of the bridge called for a graceful arch that soars 266 feet (81 m) above the Kill Van Kull and supports a road bed for 1,675 feet (511 m) without intermediary piers, though two viaducts at either end of the main span would allow the roadway to rise up to the height of the arch. :9, 12 In particular, the Port Richmond viaduct was 2,010 feet (610 m) long and the Bayonne viaduct was 3,010 feet (920 m) long, supported by piers that ranged from 20 to 110 feet (6.1 to 33.5 m) tall. :12 The total length of the bridge is 5,780 feet (1,760 m) with a mid-span clearance above the water of 150 feet (46 m) in order to make room for the United States Navy's tallest ships at the time. :9 The arch resembles a parabola, but is made up of 40 linear segments. The design of the steel arch is influenced by the Hell Gate Bridge designed by Ammann's mentor, Gustav Lindenthal. Gilbert had designed an ornamental granite sheathing over the steelwork as part of the original proposal, but as in the case of the George Washington Bridge, the stone sheathing was eliminated in order to lower the cost of the bridge due to material shortages during the Great Depression, leaving the steel trusses exposed on both bridges. It was the first bridge to employ manganese steel for the main arch ribs and rivets. The Bayonne Bridge opened on November 15, 1931, after dedication ceremonies were held the previous day. :16 On opening day, about 7,000 pedestrians and 17,000 vehicles crossed the bridge. :16 The new crossing was expected to reduce Staten Islanders' average commutes by an average of 18 to 20 minutes, since motorists from the north and east previously had to go to the west side of Staten Island and enter using the Goethals Bridge or Outerbridge Crossing. The Bayonne Bridge's dedication ceremony was attended by David M. Dow, the Secretary for Australia in the United States, and the same pair of golden shears used to cut the ribbon was sent to Australia for the ribbon-cutting of the Sydney Harbour Bridge four months later. :19 After the ceremony in Sydney, the scissor blades were separated and one was sent back to the Port Authority. Time referred to the symmetric detail of the bridge as "impressive and haunting," while the commune of Bayonne in France sent a congratulatory telegram. When the Bayonne Bridge opened, it was the longest steel arch bridge in the world, barely surpassing its more massive-arched "sister bridge" in Australia—the Sydney Harbour Bridge—by 25 feet (7.6 m) and taking the distinction from the Hell Gate Bridge a few miles to the northeast. :19 The American Institute for Steel Construction selected the Bayonne Bridge as the "Most Beautiful Steel Bridge" in 1931, choosing it over the George Washington Bridge for that status. :9, 16 The Bayonne Bridge has a lightweight design, weighing only 16,000 short tons (15,000 t), compared to the Sydney Harbour Bridge's 37,000 short tons (34,000 t). The Bayonne Bridge is also half as wide and 117 feet (36 m) shorter than its sister bridge, with its roadway being 85 feet (26 m) wide and the arch's highest point being 325 feet (99 m). The bridge became a National Historic Civil Engineering Landmark in 1985. It was the longest through arch bridge in the world. In the 2000s, the Port Authority started planning on a project to allow larger container ships to use the Kill Van Kull. The expansion of the Panama Canal, which allows the passage of larger ships coming from Asia to reach the East Coast, also made the bridge too low for these larger ships to pass under it on the way to and from Newark Bay. Its clearance of between 151 to 156 feet (46–48 m) above the Kill Van Kull depending on the tide meant that some contemporary ships, which could reach 175 feet (53 m) above the waterline, had to fold down antenna masts, take on ballast, or wait for low tide to pass through. New, larger "New Panamax" ships made it worse. If the problem were not fixed, the Port of New York and New Jersey could have lost significant shipping business to other ports such as Charleston, South Carolina. In August 2009, the Port Authority started a planning analysis to determine how to fix the air draft problem. The Port Authority commissioned the U.S. Army Corps of Engineers (CoE) to conduct a study of the question, which was completed in 2009, and authorized up to $10 million for planning and engineering services to develop options to deal with the bridge's low clearance. The CoE study looked at three options for the bridge, besides the no-build option. :PDF p. 4 The quickest option they identified, and the one ultimately chosen, was a $1.7 billion project to raise the bridge's roadway to increase its height by 40 percent, which could be accomplished by 2019 at the earliest. It would need a clearance of 215 feet (66 m) to handle the new ships. Another option presented was to build a new cable-stayed bridge, which would have cost $2.15 billion and taken until 2022.:33, 35–36 The most expensive option would be to get rid of the bridge altogether and replace it with either a bored tunnel or a immersed tunnel through which traffic would traverse under the Kill Van Kull. This option would have taken the longest, being complete in 2024 and costing $2.2 to $3 billion. :34–36 In initial planning documents, a vertical-lift bridge was also considered, but this was not investigated further in the CoE study. Another study, an environmental review by the U.S. Coast Guard, was commissioned in 2009. The review was required because the project would take place over a navigable waterway. The study cost over $2 million, took four years, and resulted in 5,000 pages of reviews. Despite its duration and cost, which precluded the start of construction until 2013, it was one of the Coast Guard's quickest environmental reviews for such a major project. In March 2012, the Port Authority submitted a request to the federal government for an expedited environmental review process, which was approved in July 2012 even though some residents in Newark and Staten Island said they wanted the Coast Guard to conduct a full environmental review. According to the Port Authority, the "Raise the Roadway" project will have many benefits, the first being that it would allow larger, more environmentally friendly ships to pass through the port. As a result of the project, the proportion of the arc above the roadway would be reduced, with only 22 cables suspending the new roadway below the arch as opposed to 30 cables holding up the old roadway. As for the roadway itself, the single roadway would be replaced by two new roadway decks with new supporting piers and approach roads. NY/NJ 440 would be widened from one 40-foot (12 m) roadway with no shoulders and four 10-foot (3.0 m) lanes, to two 30-foot-9-inch (9.37 m) roadways with two 12-foot (3.7 m) lanes each, a median divider, and a 4-foot-9-inch (1.45 m) shoulders. There would also be a bikeway and walkway the entire length of the bridge, with access ramps to replace stairs. The design also allows for future transit service such as light rail. Extending the Hudson-Bergen Light Rail line to Staten Island over the bridge has been proposed, though final design plans do not include a rapid transit component. Finally, the project would support nearly 2,800 jobs and $240–380 million in wages throughout the construction industry, as well as $1.6 billion of economic activity. The CoE estimated that raising the Bayonne Bridge would produce a $3.3 billion national benefit, noting that 12% of all US international containers pass under the bridge, that the port indirectly creates 269,900 jobs, and that port activity generates $11 billion in annual national wages. The project would allow 12,000-container ships to pass under the bridge, increasing capacity; before the project, the largest ships allowed to pass under the bridge were 9,000-container ships. Congressmen from both New York and New Jersey pressed the Port Authority to act quickly, despite lowered revenues from reduced traffic at the Port Authority's six crossings. The Port Authority announced its official plan in 2011. The Coast Guard held two public meetings about the bridge in 2012. Improvements at Port Jersey on the Upper New York Bay were also underway. The Port Authority believed that it was possible to build the new roadway without interrupting traffic flow between Staten Island and Bayonne. In July 2012, the Port Authority announced construction would begin in the middle of 2013, to be completed by 2017. In this timeline, removal of the existing roadway would be completed by late 2015, in time for the opening of the widened Panama Canal. The project would cost $1.7 billion and last five years. One of the challenges faced by the project was the tight confines of the construction area: residential homes lay less than 20 ft (6.1 m) from the work site, though none of them were in the path of the construction itself. In 2014, Staten Islanders living near the Port Richmond work site filed a lawsuit, alleging that the construction work violated the Civil Rights Act of 1964 by exposing predominately-minority communities in Port Richmond to toxins. In 2015, some Bayonne residents lodged complaints due to excessive noise, vibrations, dust over their neighborhood, and construction debris falling off the bridge (such as paint chips), though the Port Authority later settled those complaints. The project would also necessitate the temporary closure of a park in Bayonne. Additionally, the Bayonne Bridge would remain open to vehicle traffic throughout the construction. On April 24, 2013, the Port Authority's Board of Commissioners awarded a $743.3 million contract to a joint venture of Skanska Koch and Kiewit Infrastructure Company. The bridge's clearance would be raised approximately 60 feet (18 m), from 155 feet (47 m) to 215 feet (66 m), with the construction of a new roadway above the existing roadway within the current arch structure. The construction involved building support columns first, then adding prefabricated road segments using a gantry crane that rolled on top of the arch. The gantry crane would construct one rope-supported section of the new roadway at a time, using a temporary beam to support the existing roadway while each rope was replaced. The existing roadway would then be removed. Temporary bridge closures allowed new floor beams to be attached to the arch's ropes in order to support steel stringers that would hold up the new roadway. This work was expedited by Barack Obama's presidential administration due to the importance of the project to national commerce, being one of the first applicants to Obama's "We Can't Wait" initiative of important infrastructure projects. New Jersey Governor Chris Christie also considered the project a high priority for his state. The pedestrian walkway, cantilevered from the western side of the roadway, was temporarily closed on August 5, 2013, for reconstruction. It will be moved to the eastern side of the bridge. The walkway was scheduled to reopen in 2017. In 2015, the completion date was delayed to 2019, due to unfavorable weather conditions in the winter of 2014–2015. The Port Authority revised its timeline, expecting traffic to be shifted to the new roadway in early 2017, the old roadway to be removed by late 2017, and the project to be completed in mid-2019 with the completion of the roadway for southbound traffic. In November 2016, the future northbound span, intended temporarily for both directions of travel, was completed. On February 20, 2017, the completed eastern (future northbound) roadway opened for traffic, with one lane in each direction, and the old lower roadway was permanently closed. The western (future southbound) roadway was scheduled to be completed in 2019, at which time there would be two lanes in each direction and a pedestrian walkway. Also on February 20, the Bayonne Bridge became the first Port Authority crossing to use a fully automated and cashless electronic toll collection system. All vehicles proceed without stopping at the toll plaza. Those with E-ZPass are billed in the usual way, while cameras record the license plate numbers of those without an E-ZPass tag and their registered owners soon receive a toll bill by mail. Two years later, on February 11, 2019, the new southbound roadway was completed, and the traffic flow of the bridge was restored to two lanes in each direction. From January to November 2016, the Bayonne Bridge carried about 4,500 vehicles per day. The E-ZPass automatic collection system was used by 91% of drivers for toll payment. In 2011, it carried an average of 19,378 vehicles per day,:2 which dropped to a daily average of 15,221 vehicles in 2014 after construction started,:61 and further to 10,840 in 2015. The Bayonne Bridge is more lightly trafficked than any other Port Authority crossing. In September 2007, MTA Regional Bus Operations began a limited-stop bus route (the S89) that crosses the bridge. The route's termini are the Hylan Boulevard bus terminal in Eltingville, Staten Island and the 34th Street Hudson-Bergen Light Rail Station in Bayonne. This is the first interstate bus service offered by the MTA. Tolls are collected on vehicles traveling into Staten Island; there is no toll for vehicles traveling into New Jersey. As of December 6, 2015[update], the cash tolls going from Bayonne to Staten Island are $15 for cars and motorcycles; there is no toll for passenger vehicles going from Staten Island to Bayonne. During off-peak hours, E-ZPass rates are $10.50 for cars and $9.50 for motorcycles. Peak-hour E-ZPass rates are $12.50 for cars and $11.50 for motorcycles. Tolls are collected only for southbound traffic. Originally, tolls were collected in both directions. In August 1970, the toll was abolished for northbound drivers, and at the same time, southbound drivers saw their tolls doubled. The tolls of eleven other New York–New Jersey and Hudson River crossings along a 130-mile (210 km) stretch, from the Outerbridge Crossing in the south to the Rip Van Winkle Bridge in the north, were also changed to eastbound-only at that time. Open-road cashless tolling began on February 20, 2017. The tollbooths were dismantled, and drivers were no longer able to pay cash at the bridge. Instead, there are cameras mounted onto new overhead gantries located on the Staten Island side. Drivers without E-ZPass have a picture of their license plate taken, and a bill for the toll is mailed to them. For E-ZPass users, sensors detect their transponders wirelessly. The Bayonne Bridge appears in the 2005 science fiction film War of the Worlds, being shown in the background several times in the scenes set in the lead character's Bayonne home; it is destroyed in an attack by aliens. 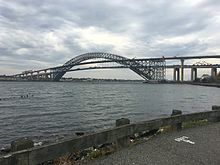 The bridge and surrounding Bayonne community was also featured in the 2001 film A Beautiful Mind and the HBO prison drama Oz. ^ a b "New Toll Fare Rates for the Bridges & Tunnels Effective December 6, 2015 at 3:00 AM". Port Authority of New York & New Jersey. Retrieved November 23, 2015. ^ a b c d e f g h i j k l m n o Rastorfer, Darl (2007). Bayonne Bridge: A Landmark by Land, Sea, and Air (PDF). New York: Port Authority of New York and New Jersey. ISBN 0-9789640-1-2. ^ a b c d e f g h i j k l m Ogorodnikov, Vitali (April 22, 2016). "Bayonne Bridge Reconstruction: Raising the Road on America's Largest Suspended Arch Bridge". New York YIMBY. Retrieved February 18, 2017. ^ "Would Benefit Jersey – C.R. Parliman Advocates Kill van Kull Tunnel Plan". The New York Times. February 9, 1930. ISSN 0362-4331. Retrieved June 6, 2018. ^ a b c "Bayonne Bridge, Staten Island to New Jersey – Forgotten New York". Forgotten New York. Retrieved February 18, 2017. ^ "Bayonne Bridge - Historic Overview". nycroads.com. Archived from the original on September 3, 2009. Retrieved September 28, 2009. ^ Ascher, Kate (March 21, 2014). "Going Up! A Bridge Makes Way for Bigger Ships". The New York Times. Retrieved April 25, 2016. ^ Bonanos, Christopher (1992). "The Father of Modern Bridges". American Heritage of Invention & Technology. 8 (1): 8–20. Archived from the original on July 27, 2010. Retrieved May 30, 2010. ^ a b c "Bayonne Bridge". ASCE Metropolitan Section. Retrieved November 12, 2016. ^ "Advance historic page from September 19, 1928: Ground-breaking for Bayonne Bridge construction". SILive.com. September 19, 1928. Retrieved February 18, 2017. ^ a b c "New Bayonne Span Opens Next Sunday – $16,000,000 Bridge Will Save Time for City Motorists Driving to Staten Island – Results of Tests Given – Combination Rates to Be Offered on Span When Used With Holland Tunnel or Other Bridges – Aid to Long Island Motorists – Reports on Using New Span". The New York Times. November 8, 1931. ISSN 0362-4331. Retrieved March 19, 2018. ^ a b "Officials plan to raise roadbed of Bayonne Bridge without stopping traffic". NJ.com. Retrieved February 18, 2017. ^ a b "Two States Open Bayonne Bridge, Forming Fifth Link". The New York Times. November 15, 1931. p. 1. Retrieved October 28, 2008. ^ "World's Longest Arch Span in Kill Van Kull Bridge". Popular Mechanics. September 1930. p. 471. Retrieved January 8, 2010. ^ "Bayonne Span Wins Award for Beauty". The New York Times. June 10, 1932. p. 14. Retrieved October 28, 2008. ^ "Facts & Info - Bayonne Bridge". The Port Authority of NY & NJ. Retrieved February 18, 2017. ^ Adams, Arthur G. (January 1, 1996). The Hudson Through the Years. Fordham Univ Press. ISBN 9780823216772. ^ "ASCE Metropolitan Section - Bayonne Bridge". www.ascemetsection.org. Retrieved February 18, 2017. ^ "The Bayonne Bridge Becomes a Historic Landmark, Officially". The New York Times. November 16, 1985. ISSN 0362-4331. Retrieved February 18, 2017. ^ a b c "Most liquor licenses? Bumpiest town? Local municipalities hold unusual distinctions," Archived August 29, 2017, at the Wayback MachineUnion City Reporter, August 27, 2006. ^ a b c d e Heffernan, Tim (April 2015). "A Bridge Too Low". The Atlantic. ^ a b c "Sires pressures U.S. Army Corps of Engineers to fix Bayonne Bridge problem". The Jersey Journal. September 28, 2009. Retrieved February 18, 2017. ^ "Port Authority Board Approves $10 Million Planning Authorization to Tackle Bayonne Bridge Navigation Issues" (Press release). Port Authority of New York and New Jersey. August 13, 2009. Retrieved March 13, 2010. ^ a b c "Bayonne Bridge Air Draft Analysis: Prepared for The Port Commerce Department, The Port Authority of New York and New Jersey" (PDF). Port Authority of New York and New Jersey. United States Army Corps of Engineers New York District. September 2009. Retrieved February 18, 2017. ^ "Bayonne Bridge Navigational Clearance Program - Draft Environmental Assessment". U.S. Government Printing Office. Retrieved January 1, 2013. ^ "Bayonne Bridge Navigational Clearance Program Final Environmental Assessment" (PDF). uscg.mil. United States Coast Guard. May 2013. Retrieved February 18, 2017. ^ a b c Roberts, Sam (January 2, 2014). "Long Review of Bayonne Bridge Project Is Assailed". The New York Times. ISSN 0362-4331. Retrieved February 18, 2017. ^ Leach, Peter T. (March 26, 2012). "NY-NJ Port Authority Submits Bayonne Bridge Plan for Fast US Review". The Journal of Commerce. Retrieved July 22, 2012. ^ Strunsky, Steve (July 18, 2012). "Port Authority accelerates plan to raise Bayonne Bridge roadway". The Star-Ledger. Newark. Retrieved July 22, 2012. ^ "Panama Canal project causes concern around eastern ports". WNYW TV. Archived from the original on February 25, 2013. Retrieved February 23, 2013. ^ a b c "About the Navigational Clearance Project". Port Authority of New York & New Jersey. Retrieved November 16, 2016. ^ a b c "How and Why They Are Raising the Bayonne Bridge Roadway". The New York Times. March 21, 2014. ISSN 0362-4331. Retrieved February 17, 2017. ^ "Bayonne Bridge Navigational Clearance Project: Frequently Asked Questions". Port Authority of New York & New Jersey. Retrieved November 16, 2016. ^ "Hudson-Bergen Light Rail may be extended over Bayonne Bridge to Staten Island". The Jersey Journal. January 13, 2011. Retrieved September 20, 2011. ^ Dominowski, Michael W. (June 16, 2013). "Staten Island dream of a train to New Jersey may be derailed again". Staten Island Advance. Retrieved June 19, 2013. ^ a b c d e f Sullivan, Al (May 1, 2013). "Up it goes – Raising of Bayonne Bridge roadway to start by year's end". Hudson Reporter. Archived from the original on February 19, 2017. Retrieved February 18, 2017. ^ Hack, Charles (September 29, 2009). "Pressing P.A. to Take Action On Raising Bayonne Bridge". The Jersey Journal. Retrieved March 13, 2010. ^ Strunsky, Steve (May 31, 2010). "Bayonne Bridge Height Fixes Could Cost Millions, Port Authority's Revenue Fades". The Star-Ledger. Newark. Archived from the original on June 4, 2010. Retrieved June 1, 2010. ^ Zeitlinger, Ron (January 4, 2012). "2 public meetings scheduled on plan to raise Bayonne Bridge". The Jersey Journal. ^ a b Slowey, Kim (October 5, 2015). "Skanska JV's NJ Bayonne Bridge project delayed 2 years". Construction Dive. Retrieved February 18, 2017. ^ Economopoulos, Aristide (January 28, 2014). "Staten Islanders file civil rights complaint against Bayonne Bridge project". The Star-Ledger. Retrieved February 18, 2017. ^ Barone, Vincent (July 6, 2015). "Bayonne Bridge work makes life miserable for area residents". SI Live. Retrieved February 18, 2017. ^ a b c d "Bayonne Bridge Navigational Clearance Program". Port Authority of New York and New Jersey. Archived from the original on June 28, 2011. Retrieved July 4, 2011. ^ "The Port Authority Board of Commissioners Awards Contract to Raise the Roadway of the Bayonne Bridge". Port Authority of NY & NJ. April 24, 2013. Retrieved February 18, 2017. ^ a b Whelan, Robbie (October 1, 2015). "Bayonne Bridge Raising Project Delayed to Late 2017". WSJ. Retrieved February 18, 2017. ^ "Bayonne Bridge: Pedestrian & Bicycle Information". Port Authority of New York & New Jersey. Retrieved November 16, 2016. ^ Gould, Brandon (August 6, 2013). "Bayonne Bridge walkway shut to walkers, cyclists until raising is done". The Jersey Journal. Retrieved February 18, 2017. ^ "Bayonne Bridge project reaches milestone: Elevated roadway installed (photos)". NJ.com. Retrieved February 18, 2017. 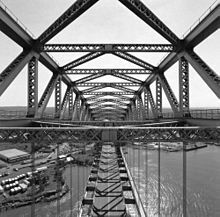 ^ "Bayonne Bridge's Elevated Roadway Unveiled". NBC New York. November 15, 2016. Retrieved February 18, 2017. ^ a b Villanova, Patrick. "Bayonne Bridge's new elevated roadway set to open", The Jersey Journal, February 17, 2017. Accessed February 17, 2017. "A new era for the Bayonne Bridge will begin Monday when the newly constructed elevated roadway on the 85-year-old arch bridge opens to drivers.... Last week, the Port Authority revealed the bridge's new cashless toll on the Staten Island side of the Kill van Kull.... Toll payments will not change for drivers with E-ZPass, but for the less than 10 percent of Bayonne Bridge drivers who do not use E-ZPass, an overhead camera will photograph their vehicle's license plate and a toll bill will be mailed to the registered owner." ^ Keag, Susan Lunny. "'It was thrilling': Bayonne Bridge's new elevated roadway opens". silive.com. Retrieved February 23, 2017. ^ a b Keag, Susan Lunny. "Cashless tolling begins Monday on Bayonne Bridge". silive.com. Retrieved February 23, 2017. ^ Knudson, Annalise (February 11, 2019). "Crossing the higher, wider Bayonne Bridge after years of construction". silive.com. Retrieved February 11, 2019. ^ "New roadway set to open on elevated Bayonne Bridge". ABC7 New York. February 9, 2019. Retrieved February 11, 2019. ^ "2011 Traffic Data Report for New York State" (PDF). New York State Department of Transportation. Appendix C. Archived from the original (PDF) on March 3, 2016. Retrieved February 18, 2017. ^ "2014 Traffic Data Report for New York State" (PDF). New York State Department of Transportation. Appendix C. Archived from the original (PDF) on June 5, 2016. Retrieved February 18, 2017. ^ "New York City Bridge Traffic Volumes" (PDF). New York City Department of Transportation. 2015. p. 11. Retrieved March 16, 2018. ^ "MTA NYC Transit Adds Bus Service from Staten Island to Hudson Bergen Light Rail, Advances MTA Commitment to Seamless Regional Transportation" (Press release). Metropolitan Transportation Authority. July 16, 2007. Retrieved February 18, 2017. ^ a b Beale, Lewis (November 16, 2004). "Tom Cruise and Some Martians Take a Liking to Bayonne". The New York Times. Retrieved February 18, 2017. Historic American Engineering Record (HAER) No. NJ-66, "Bayonne Bridge"
This page was last edited on 21 April 2019, at 20:27 (UTC).